Oftentimes I would buy our supply of food at the favorite supermarkets. They pack everything nicely and neatly, which also means they charge us accordingly. 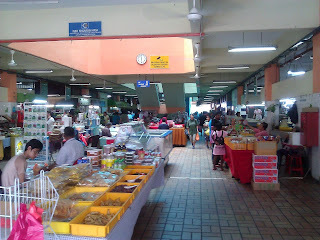 A friend long ago informed me of TTDI market and everytime I visited that wet market, it has always been a pleasant experience. The prices are always so reasonable. The place kept clean. Access to fresh PORK at the basement floor. Beautiful fresh veggies. 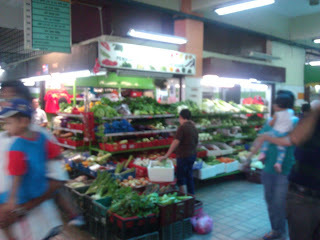 Highly recommended to all mothers who want to buy fresh food at reasonable price. They have a parking lot at basement with very cheap parking rate (I usually paid no more than 50 cents). I bought 20pcs of chicken wings today and I asked them to cut it in half. The 20 big pieces costs rm23. Planning a little party get together with some friends for tomorrow that's why I bought so much! You can also access superb fruits. Fresh flowers. Nice, different types of fishes and shrimp. And to top it off, everything is always packed nice and neat for you. They really do give good service... So for expats who used to be afraid of "wet market", this place may surprise you! Usually when you mention TTDI market people are familiar with it. hi everyone, would appreciate if you could kindly help out an old indian uncle if you ever visit this market. it's actually very heart-breaking to see him tending to his stall all by himself. he is selling vegetables and some groceries just two stalls away from a chinese eggs seller stall. his stall is the last stall on that row. he basically is quite lonely and his wife passed away quite some time ago and his son is in india and never visit him. he has a daughter but is married with 6 kids and hardly visit him as well. he hardly make ends meet and he is of a very old age. if u coming from the front facing entrance of the market (facing the condominium, as u go up the stairs, it's the third lane on your right and towards the end. the last stall on your right. same row as the egg stall and corner wood furniture stall. lets hope that he will be in good health and his daughter will visit him more. he is very independent and hard working even at such old age, he is still working hard all alone and doesnt ask for charity or help. p/s: im not from any charity organisations nor am i related to this uncle. im just one of the people that frequent the market once a week and would just hope that we could just help him by giving him more business or any other means..
while we are all happily celebrating mother's day, father's day or even birthdays or new year, he is has no one and all alone..